Waste-Free Jackman: It's Apple Time! One of the best things about autumn in Ontario is... APPLES! And there are lots of fresh, local apples available at the grocery stores and markets these days. Apples make a great snack for kids at school. Here is some apple advice from Jackman's Eco Team. First of all, you could send a whole apple. It's easy... no need to package it. Problem is, many kids struggle to eat a whole apple. Sometimes, kids take a few bites and toss the rest in the garbage or compost. Check with your child to see if they have what it takes to eat the whole thing. Or look for small sized apples at your favourite grocery store. Now, you can cut the apples into small wedges and throw them in reusable containers for school snacks. Then your child can eat a few slices instead of the whole apple. Problem solved... well sort of. The cut apple slices go brown over time. Solution... soak your apple slices in salt water. Simply mix 1/2 teaspoon of salt with 1 cup of cold water. Soak for 10 minutes, drain and rinse. Then store them in reusable containers. It works! Tip - Granny Smith apples don't brown as much as other varieties). Another Tip - Sprinkle the apple slices with some cinnamon for some added flavour. Here's another idea... make some applesauce to send for school snack. 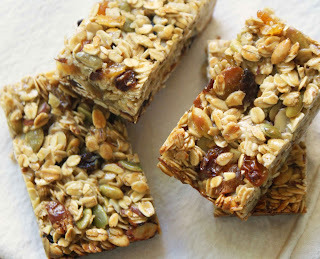 It's super easy to make and kids love it. No need for store-bought applesauce. Homemade apple sauce is so easy to make and it tastes great too. Here's an easy Applesauce Recipe for you to try. Send the applesauce to school in small, reusable containers. Oh, and don't forget to pack a reusable spoon. By the way, I like to make a big pot of applesauce and then freeze some for later use (just like my mom used to do when I was a kid). Did you know apples make tasty muffins? 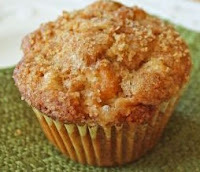 And of course, an apple muffin recipe is just a Google search away. What are you waiting for? It's time to bake! If you want to get really creative, why not make some apple chips? 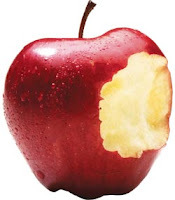 Take the core out of the apple, then cut into thin slices. Place on a baking tray in a single layer. Bake in the oven for several hours at 200 degrees. Yum.